Wingham Protestant Reformed Church - Welcome! Wingham Protestant Reformed Church warmly welcomes you! Please feel free to browse our site for more information about our congregational life, and denomination and doctrines. 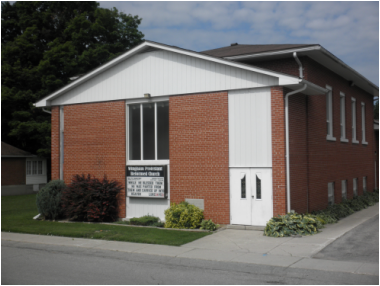 Our church is located in Wingham, Ontario, Canada. Services are held on Sundays at 10:30 a.m. and 1:00 p.m. Eastern Standard Time. Worship services are reverent and God-glorifying and centre on the preaching of a sovereign grace gospel, which is faithful to the Scriptures. Visit Meditation to read today's meditation. Interested in learning more about the Protestant Reformed Churches? Click here to watch a video introducing the PRC or visit the Protestant Reformed Church's website.